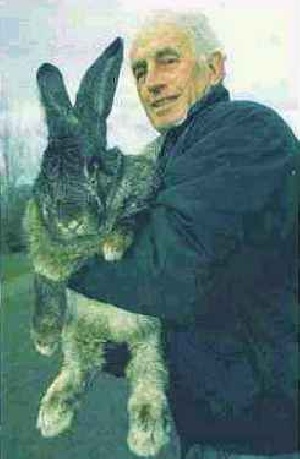 Posted: Wed Nov 29, 2006 6:12 pm Post subject: Biggest Rabbit Ever!!! What did you feed that thing? Its the whererabit, lol, I use to have a bunny rabit when I was a kid, so long ago. It died halloween night because kids gave it those candy corn candies and the rabit died of a sugar overdose, who would figure, there little hearts cant take it. Kind of like dogs and chocolate. What did they give that rabbit for food Miracle Grow? Looks like a Flemish Giant? They do get big. he has been feeding that rabbit kids just look at the funny look in its eye. Yes they do get big..... but not that big! Can I suspect a little photo-shop here?! bet owner used grow bag stuff instead of hay for bedding. whats the matter aiden have we said something to upset u.we were only joking about the rabbit.i love rabbits i have a lion head myself she i abou half the size of this one the one we had before looked like a wild hare and she was the same size as the one we have now. Rabbits are freakish is you ask me! There is something about rabbits that bug me! Not to mention, that some people actually eat them for supper?! Maybe I just don't like rabbits!!! oh well each to there own. really wow what did it taste like. It is a mild tasting meat like squirrel or alligator not a wild game flavor at all. All are very good tasting. have u had squirral and alligator too.my cousin told me the other day that my dad used to breed rabbits to keep our food supply going cos we were poor i had no idea i thought they were just pets and my dad bred them to sell the babies.thinking back i never did see any buyers come to collect the babies i can just remember them all being there then not being there.